My boyfriend loved this coffee! we will definitely be ordering again. This coffee was a good purchase for someone who loves wine! I purchased this as a gift for my best friend who stated it smelled good when grinding and had slight spiciness to it after it was brewed. She enjoyed it overall. Unique gift for coffee and wine lovers! She loved it as a gift. I will be buying this for not only her again but me too! Coffee and wine lovers rejoice! This was the perfect fusion of my best friend's two favorite beverages. I gave it to her for Christmas and she can't get enough of it! I may get it again for other family mewmbers. Good coffee with merlot taste added. Fun Gift. My sister loved it!!!! Now she wants the bourbon infused next....LOL...she'll be getting that in a week or so. still spoiled! 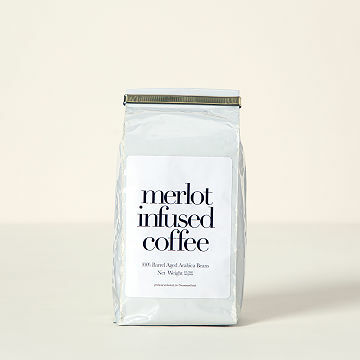 This coffee is aged in Merlot wine barrels for a subtle infusion of wine notes.